John Coltrane teaming up with Johnny Hartman in 1963...and Kirk Whalum's latest project featuring his brother Kevin entitled Romance Language (in spite of the many years that separate these recordings) bear many more similarities than differences. In fact the end result is exactly the same; romance at a level so intense that verbal language alone is inadequate to portray. Here s an attempt: easily two of the most romantic jazz albums of their respective eras. They Say It's Wonderful; Dedicated To You; My One And Only Love; Lush Life; You Are Too Beautiful; Autumn Serenade; Almost Doesn't Count; I Wish I Wasn't; I Wanna Know; Spend My Life With You. 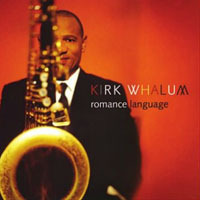 Kirk Whalum: tenor saxophone, soprano saxophone, flute; Kevin Whalum: vocals (1-6); Hugh "Peanuts" Whalum: vocal (7); Marcus Finnie: drums; Braylon Lacy: bass; Kevin Turner: electric guitar; Michael "Nomad" Ripoll: acoustic guitar; Ralph Lofton: organ; John Stoddart: piano, keyboards, organ (10), backing vocals (9); Bashiri Johnson: percussion (1, 5, 7, 8, 10); Javier Solis: percussion (2, 3, 6, 9); George Tidwell: flugelhorn, trumpet.